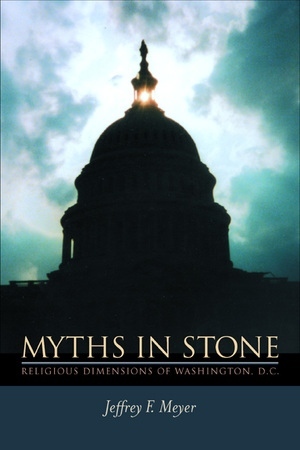 Myths in Stone Religious Dimensions of Washington, D.C. In the same letter to Washington he acknowledged that the financial state of the country would not allow the realization of such a plan for many years, but that the city's scale must be such as to allow for future growth. L'Enfant was right on both counts. The city would become a great capital, but it would first pass through a period of one hundred years of painfully slow development. The delay caused nearly a century of disparaging descriptions and snide comments about the American capital. One English visitor in 1806, when told that he was entering Washington, looked in vain for buildings and houses: "Seeing none, I thought I had misunderstood the gentleman who made the remark, and turning round for an explanation, he told me, laughing, that we were almost in the very middle of it. "[Note 3] Once called the city of "magnificent distances," Charles Dickens complained in 1842 that it was only a city of "magnificent intentions." L'Enfant's original plan is still visible in Washington, his gridlike street plan, with diagonal overlays, and his central axial thoroughfares, which define the core of the city. Pennsylvania Avenue remains a main axis connecting the Capitol and White House; the Capitol's vista has become the Mall. The view from the White House now reaches past the Washington Monument to the Jefferson Memorial and the Potomac River. With the passage of time and the gathering momentum of historical events, Washington has finally become the grand capital its creator imagined, the city at the center of the world. Centrality is a dominant issue in Washington. The city was initially chosen as a compromise among conflicting regional interests and was seen as a midpoint in the geography of the existing states. [Note 4] The District of Columbia was laid out as a perfect square, ten miles on a side (the limits imposed by Article 1 of the U.S. Constitution), with its four corners pointing to each of the cardinal directions, like the ancient cities of Ur and Babylon in Mesopotamia. Instead of a ziggurat at the center, the surveyor "Mr. [Andrew] Ellicott drew a true meridional line, by celestial observation, which passes through the area intended for the Capitol. This line he crossed by another, running due east and west, which passes through the same area. "[Note 5] The site for the Capitol building was actually moved slightly eastward, but planners still kept the central symbolism, using the actual location of the Capitol to divide the District of Columbia into Northwest, Northeast, Southwest, and Southeast quadrants. The numbered and lettered streets of the city all originate at the Capitol. This aspiration to centrality would increase over time, symbolic and practical factors interwoven. The visitor to Washington experiences numerous sites and signs like the Capitol dome, symbolically rich and conveying a variety of messages, some of them paradoxical or even downright contradictory. If the Freedom figure, as interpreted by Jefferson Davis, recalls the contentions of slaveholders against abolitionists, there is a counterpoint exactly one mile to the east. In the middle of Lincoln Park stands Thomas Ball's Emancipation monument of the sixteenth president freeing a slave. Ostensibly, both sculptures are dedicated to freedom, yet their histories are filled with ironies. Crawford's Freedom was cast in bronze by sculptor Clark Mills, who was sympathetic to the Confederate states and used slaves in his workshop to make the statue. On the other hand, the model for the emancipated slave who crouches below Lincoln in Ball's monument was Archer Alexander. He lived in Missouri, where his emancipation had been declared by military commander John Fremont, only to have the proclamation revoked by Abraham Lincoln. So, in reality, Lincoln had declared Alexander a slave. When Henry Kirke Brown, a Northern abolitionist, proposed a design for the eastern pediment of the House wing in 1855, it was rejected because it included a slave which Montgomery Meigs felt would offend Southern sensibilities. Then, implausibly, when Brown proposed a pediment containing eight slave figures for the lavish statehouse of South Carolina at Columbia, his design was accepted. [Note 9] The Crawford and Ball "freedom" sculptures suggest something of the complexity and paradoxicality of Washington's symbolism as well as the riskiness of any "final" interpretation of its meaning. They also touch on the central issue of individual and communal understanding: who are the "chosen people"? For Davis, the national community was restricted to white Americans. The Lincoln sculpture, despite the ironies just mentioned, offers a different message. Erected in 1876, thanks to contributions of emancipated African Americans, it symbolizes an early step in their long struggle to become part of the "chosen people." There is a religious message implicit in most of the buildings, memorials, art, and iconography of Washington that recalls the original conviction so often stated by the Founding Fathers, that the Almighty stood behind the American experiment. As the Great Seal of the United States proclaims, annuit coeptis, novus ordo seclorum: "He [God] gave his approval to these beginnings, a new world order." This is nowhere manifest more clearly than in the Capitol building, the "Temple of Liberty." When at last the bronze head of Freedom was formally hoisted into place on December 2, 1863, the adjutant general's office ordered a ceremony that would rally Union troops and unmistakably confirm "this material symbol of the principle on which our government is based. "[Note 10] Freedom was ritually installed to the thunder of cannons: a thirty-five-gun salute (for the number of states in the Union in 1863) from a field battery on Capitol Hill, which was then answered in succession by a similar thirty-five-gun salute from the twelve forts that encircled and protected the capital. However questionable Freedom's symbolism, since that time the Capitol has possessed the requisite architectural grandeur to be what its designers had always hoped it would be, the moral and ideological center of city and nation. There are two metaphors that I have found helpful in my attempts to understand the symbolism of Washington, D.C. One is the metaphor of archeology, whose task is to uncover earlier layers of human culture. The second is the metaphor of pilgrimage, the human desire to make journeys to a sacred destination. The first metaphor is principally temporal and requires the investigation of earlier historical epochs, their capitals, and the meaning their architecture conveys. These original meanings, though often hidden and ambiguous, still in some way exert their allure today. They are like a fine vessel or other archeological find from a past civilization. The second metaphor is more spatial, requiring a methodical visitation of Washington's most significant contemporary physical structures. The axial structure of the city invites the visitor to follow a systematic route. So just as traditional pilgrimage centers like Jerusalem, Mecca, and Banaras display a circuit or prescribed route for the pilgrim to follow, I have made a pilgrimage circuit of Washington, beginning at the Capitol, walking the three major axes of the ceremonial core of the city, and ending where I began, at the Capitol. My two metaphors converge in one description of the pilgrimage experience as "a vertical shaft driven into the past, disclosing deep strata of ancient symbols, potent signifiers (sacred symbol-vehicles such as images, paintings, proper names, and places) which reinforce nationalistic sentiments. "[Note 11] The metaphorical first layer is the most obvious and accessible complex of ideas and ideals representing what scholars have called, in recent decades, "civil religion. "[Note 12] The expression originates with Jean-Jacques Rousseau. The French philosopher believed that some religion was necessary as an ideology to support any civil society, but he rejected Christianity as inadequate in a revolutionary era. In its place he advocated a generic faith that he called "civil religion." Its general features included belief in an Almighty Power as guarantor of society's morality and civic order, who rewarded the good and punished evil in the afterlife. The Divine Power of Rousseau's civil religion was not the inactive Being of strict Deism but remained interested in human social harmony and provided sanctions to restrain those who might otherwise plot to upset the system. The purpose of civic rituals was to dramatize and celebrate society's values and moral code. In the America of the Founding Fathers, civil religion was frequently expressed by politicians and preachers and enacted in rituals such as the Masonic rite of laying the cornerstone of the Capitol. Washington, Jefferson, Benjamin Franklin, John Adams, and others believed that the deity was actively interested in the success of the American experiment as a model that could eventually serve as a shining example for the rest of the world. They considered this novel experiment in freedom and democracy an epochal event, calling it a novus ordo seclorum (a new order in the world) on the Great Seal they devised for the United States. Nothing like it had been seen before, although there were brief classical foreshadowings in democratic Greece and republican Rome. Already in 1787 Representative James Wilson prophesied that the federal government would "lay a foundation for erecting temples of Liberty in every part of the earth. "[Note 13] As he lay dying in June of 1826, Thomas Jefferson wrote to the mayor of Washington, echoing the faith of the Founding Fathers that this new democratic form of government might be "to the world, what I believe it will be, (to some parts sooner, to others later, but finally to all)" a signal to arouse men to burst their chains of slavery. [Note 14] This faith may be seen everywhere in the city but is nowhere more eloquently and fully expressed than in the art and architecture of the Capitol. Besides the clear expressions of civil religion, there are older and less obvious strands of religious meaning in Washington, which have their roots in the world of biblical thought, both Jewish and Christian. At the foundation of American politics is the deliberate attempt to separate the state from any specific church, while at the same time protecting the right of citizens to freely practice their religions. Still, the Founding Fathers were in certain ways embedded in the world of biblical language and thought because it had, over the centuries, so thoroughly penetrated European and American culture. They spoke the words of the Bible, and they thought by its metaphors. Commenting, for example, on Alexander Hamilton's deft financial strategy that allowed Washington to be built on the Potomac site, lawyer and statesman Daniel Webster said: "He smote the rock of natural resources, and abundant streams of revenue gushed forth. "[Note 15] For reasons not difficult to understand, the Christian founders of the colonies found the episodes in the Old Testament more useful than the New Testament to justify their enterprise in the New World. Compelling and ominous images of the New World as the "Promised Land" and the colonists as the "New Israel" exerted undeniable influence on the minds of settlers as they strove to interpret their experiences in America and justify their conquest of the indigenous peoples they encountered. At a deeper level, the Bible raised troublesome issues and posed questions that may not have seemed important in other cultures. First, because the Bible revealed a God who acted in history, significant events had to be examined and interpreted in that light. Whereas the great Hindu and Buddhist cultures of Asia might dismiss specific historical events as meaningless, Christian theologians and thinkers labored to make sense of all the major occurrences of human history. A second issue rooted in biblical thought was the tendency to elevate good and evil to transcendent dimensions, sometimes personalizing them as God and Satan. A third might be called "bibliolatry," the worship of specific texts as sacred. Because they considered their holy scriptures to be the very word of God, Jewish and Christian believers were predisposed to venerate such secular writings as the Declaration of Independence and the Constitution as they would divinely revealed documents. These three themes are the most significant for my analysis of Washington because they imply patterns of thinking that not only dictated how questions would be answered but more fundamentally determined which questions would be asked at all. At the deepest level of investigation the visitor to Washington sees the very beginnings of urbanism. Urban historian Lewis Mumford pointed out long ago that it was the conjunction of the sacred and secular power that first gave rise to cities in the river valleys of the ancient world. [Note 16] Kings and their architects strove to devise ways to express their belief that the gods approved of the ruler and that the royal city was directly related to the heavenly world of the gods and the structure of the cosmos. They built temples and palaces, laid out ceremonial avenues, and designed whole cities to imitate the geometry of the universe as they understood it. These architectural arrangements expressed the belief that heaven and earth should be in harmony, and many of the early methods of expressing this harmony have been repeated in the language of architecture and city planning down through the millennia. That is to say, the vocabulary of architecture and the design of cities have changed very little over the course of urban history. Visitors will find them expressed in the avenues, shrines, memorials, and monumental architecture of Washington today. Washington is a fusion of the secular and sacred, a uniquely modern blend of politics and religion that is nevertheless grounded in the archaic past. Politics and religion have always engaged the deepest convictions and commitments of human life, but of the two, religion is probably the more powerful. When they become yoked, as they normally have been throughout human history, the resultant combination is potentially explosive. The ancient fusion of secular and sacred, which gave birth to cities and to the first large-scale political entities, still functions to enlist commitment, enflame passions, and create bonds of loyalty beyond anything one could rationally explain. All of us are implicated in ways of thought and modes of feeling that have ancient roots in cultural transformations that occurred many thousands of years ago and may be, for the foreseeable future, an inevitable feature of that "strange furniture of our unconscious mind." Yet the archeology metaphor alone is not sufficient, suggesting as it does ancient and unchanging meanings and eternal verities. This immutability is an illusion because of the transience of mythic meanings and the "superabundance of architectural forms, that is, the way in which even the apparently simplest buildings invariably both transcend and subvert the deliberate intentions of their designers. "[Note 23] Because the meaning of capital cities is not static, I use the metaphor of pilgrimage as a corrective to this possible misapprehension. We do not know when the religious practice of pilgrimage first began, but it is a feature of all the major religious traditions--Hinduism, Buddhism, Taoism, Judaism, Christianity, and Islam. Perhaps it is universally attractive as a natural and powerful analogy of the human passage through life. [Note 24] Going on a pilgrimage reassures pilgrims, in a concrete way, that their lives are not just an aimless wandering about, but a movement toward a sacred destination. The act of going on a pilgrimage suggests that life has meaning. A careful analysis of pilgrimage traditions reveals useful concepts that facilitate an understanding of the national mythology. [Note 28] Pilgrimages organize space in a sophisticated and complex way, beginning at a sacred center but extending beyond it to eventually delineate a universal or cosmic system. Pilgrimages also structure time and history through the creation of pilgrimage calendars, and many sites are conceived as the place where creation took place and time began. Each of the most famous pilgrimage cities--Jerusalem, Mecca, and Banaras--is held by believers to be the center of the world and connected with creation. One can see the centrality theme developing in the growing ambition of Washington first to be the nation's center, and then the center of the world. As Chapter 1 documents, there was even a movement to restructure the world's time meridian so that it would pass through Washington instead of Greenwich. Ritual complexity is another feature of pilgrimage centers, involving traditions that embrace continuity and change, predictability and surprise, order and chaos. Washington has its rituals to reaffirm the unity of the nation, to celebrate victory, and to commemorate noble deaths. It has exemplary liturgies that reaffirm the nature of the three branches of government and their interrelationship, most prominently the inauguration of the president every four years. On the "chaotic" side there are the popular rituals enacted on the Mall, on Pennsylvania Avenue, and in Lafayette Park that bring protesters and supporters to Washington to dramatize and debate their causes. Symbolic complexity is also a feature of pilgrimage, with multiple interpenetrating levels of meaning and symbolism. Evidence of this complex network of symbols may be found throughout the city, but chiefly in the monuments and spaces of the core area. Finally, pilgrimage is usually a behavior that develops at the "bottom" and moves up. By that I mean that it is not devised and ordained by ruling powers but is the collective behavior of free individuals. Once established, of course, it may achieve official sanction, be co-opted by a clerical hierarchy, and even become a criterion of orthodoxy. But it is not so in its origin. Washington bears the imprint of many hands: the original planner L'Enfant, Washington, and Jefferson; architects Benjamin Latrobe, James Hoban, Charles Bulfinch, and Thomas Walter, superintendents; sculptors and painters such as Luigi Persico, Thomas Crawford, Augustus St. Gaudens, Constantino Brumidi; landscapists Andrew Jackson Downing and Frederick Law Olmsted Jr.; and the architects of the United States Senate Park Commission (better known as the McMillan Commission), to name only a few of the more prominent. But in many ways "the people" have shaped Washington, not only through their congressional representatives but also simply by choosing which memorials they like and which they do not, which they frequent and which they ignore. In so doing, they are "voting with their feet,"[Note 29]; they have simultaneously created the basis of the "pilgrimage route" I adopted. For example, the memorial to Ulysses S. Grant, though vast in scope, centrally placed, and skillfully executed, has never captured the allegiance and affection of most visitors to the capital. Other sites, including the Washington Monument, the Lincoln Memorial, and the Vietnam Memorial, are continually sought by throngs of visitors. In that regard, at least, poetry and mythology are the same. We, the American people, call upon the myths of the past, reinterpret them, and recreate them to make sense out of the confusion of our uncommon history. Now "we" are no longer limited to the circle of white male gentry who founded the nation and first uttered the words "We the people," but are increasingly a rainbow of colors and ethnic diversity. The more democratic character of U.S. citizenship has brought changes in the interpretation of the national myth. This enterprise of myth-making may begin when visitors to Washington experience the planning, the buildings, the spaces, and the iconography of the city. But as they "reflect on, and åplay with' the built structures in their environment, they endlessly disrupt old meanings and awaken fresh ones" in the effort to find a place for themselves in the national mythology. [Note 32] Though Pierre Charles L'Enfant's plan provided the initial impetus, the myth of Washington has been shaped through the contributions and objections, the support and obstructions of presidents, commissions, architects, engineers, superintendents, and U.S. senators and representatives, and by us, the people. Together over time, we have continued to create the myth in stone that is today's Washington. Myth-making remains. "We," however, keep changing. [Note 1] Quoted in H. Paul Caemmerer, The Life of Pierre Charles L'Enfant (Washington, D.C.: National Republic, 1950; reprint, New York: Da Capo Press, 1970), 128. [Note 2] John W. Reps, Washington on View: The Nation's Capital since 1790 (Chapel Hill: University of North Carolina Press, 1991), 20. [Note 4] The story of the selection of the site for the capital is well documented in Kenneth R. Bowling, The Creation of Washington, D.C.: The Idea and Location of the American Capital (Fairfax, Va.: George Mason University Press, 1991). [Note 5] Universal Asylum and Columbian Magazine, March 1792. Meridional line means the line drawn south from the polestar perpendicular to the east-west line of the sun's path. This surveyor's method reflects archaic patterns of determining directions and establishing a capital's centrality. It was used in the building of royal cities in many ancient cultures. [Note 6] Fred J. Maroon, The United States Capitol (New York: Steward, Tabori and Chang, 1993), 43. The quotation has been repeated countless times, but historians have tried in vain to verify it. [Note 7] Lynda Lasswell Crist, ed., The Papers of Jefferson Davis (Baton Rouge: Louisiana State University Press, 1989), 6:6-7; William C. Davis, Jefferson Davis: The Man and His Hour (New York: HarperCollins, 1991), 237. [Note 8] Letters to Meigs of March 18, 1856, and October 18, 1855, Records of the Architect of the Capitol, Washington, D.C., Curator's Office. [Note 9] Kirk Savage, Standing Soldiers, Kneeling Slaves: Race, War, and Monument in Nineteenth-Century America (Princeton, N.J.: Princeton University Press, 1997), 116, 31. [Note 10] Glenn Brown, History of the United States Capitol (Washington, D.C.: Senate Document no. 60, 56th Congress, 1st session, U.S. Government Printing Office, 1900, 1903; reprint, New York: Da Capo Press, 1970), 2:138. [Note 11] Victor Turner and Edith Turner, Image and Pilgrimage in Christian Culture: Anthropological Perspectives (New York: Columbia University Press, 1978), 106. [Note 12] On civil religion as the state religion of the United States, see Robert Bellah, "Civil Religion in America," Daedalus 96 (Winter 1967): 1-21. After this seminal article, there was a spate of scholarship on civil religion. R. B. Mathisen, reviews the later course of the discussion; see "Twenty Years after Bellah: Whatever Happened to American Civil Religion?," Sociological Analysis 50 (1989): 129-46. [Note 13] Quoted in Pamela Scott, Temple of Liberty: Building the Capitol for a New Nation (New York: Oxford University Press, 1995), 3. [Note 14] Philip S. Foner, ed., Basic Writings of Thomas Jefferson (Garden City, N.Y.: Halcyon House, 1944), 807. [Note 15] Quoted in Caemmerer, The Life of Pierre Charles L'Enfant, 134. [Note 16] Lewis Mumford, The City in History: Its Origins, Its Transformations, and Its Prospects (New York: Harcourt, Brace and World, 1961), 29-35. [Note 17] Jacquetta Hawkes, History of Mankind: Cultural and Scientific Development (New York: New American Library, 1965), 1:47. [Note 18] So fundamental were these concerns in traditional culture and so foreign to contemporary patterns of thought that the historian of religions Mircea Eliade marshaled a whole lexicon of strange classical terms to express them: omphalos, axis mundi, orientatio, templum, imago mundi, in illo tempore, imitatio dei; see Mircea Eliade, Patterns in Comparative Religion, trans. Rosemary Sheed (Cleveland: World, 1963). [Note 19] Caemmerer, The Life of Pierre Charles L'Enfant, 11-24. [Note 20] "Monumental Spaces," in Richard Longstreth, ed., The Mall in Washington, 1791-1991 (Washington, D.C.: National Gallery of Art, 1991), 25-26. [Note 21] Michael Kammen, People of Paradox: An Inquiry Concerning the Origins of American Civilization (Ithaca, N.Y.: Cornell University Press, 1980), 217. [Note 22] Catherine Bell, Ritual Perspectives and Dimensions (New York: Oxford University Press, 1997), 130. [Note 23] Lindsay Jones, Twin City Tales: A Hermeneutical Reassessment of Tula and Chichen Itza (Niwot, Colo.: University Press of Colorado, 1995), 16. Jones's book is a useful corrective and supplement to the more classic "essentialist" interpretations of cities such as Mircea Eliade and Paul Wheatley. Jones's insistence that architecture must not be studied in isolation, but as a partner in an architectural/ritual event (see 186-200), is amply illustrated by the present book. See especially Chapters 7-8. [Note 24] Social scientists paid little attention to the phenomenon of pilgrimage until Victor Turner began writing about it in the 1970s, especially (with Edith Turner) in Image and Pilgrimage. Since then the floodgates have opened, pilgrimage conferences have been held, books and articles written about pilgrimage in general as well as its expression in particular cultures. A corrective to Turner's emphasis on the communitas effect of pilgrimage is provided by J. Eade and M. Sallnow in Contesting the Sacred: The Anthropology of Christian Pilgrimage (London: Routledge, 1991). Roger Friedland and Richard Hecht have located the meaning of sacred sites not in the experience of community but in political struggles: "Power is written and rewritten from and at the center"; see "The Bodies of Nations: A Comparative Study of Religious Violence in Jerusalem and Ayodhya," History of Religions 38, no. 2 (November 1998): 149. Two general comparative studies are Alan Morinis, Sacred Journeys: The Anthropology of Pilgrimage (Westport, Conn.: Greenwood Press, 1992); and Simon Coleman and John Elsner, Pilgrimage: Past and Present in the World Religions (Cambridge, Mass. : Harvard University Press, 1995). Area studies include the writings of Surender Bhardwaj, Diana Eck, Alan Morinis, and James J. Preston on Hindu pilgrimage traditions; Susan Naquin, Yu Chunfang and Raoul Birnbaum on pilgrimage in China; F. E. Peters has written on pilgrimage in Judaism and Islam. Recent writings in American studies have opened the door to interpreting American sites as laden with sacred values, tending to blur the distinctions between sacred and secular, pilgrimage and tourism. See, for example, works by historians John F. Sears, Sacred Places: American Tourist Attractions in the Nineteenth Century (New York: Oxford University Press, 1989), and Edward Linenthal, Sacred Ground: Americans and Their Battlefields (Urbana: University of Illinois Press, 1991). As the Turners had said earlier, "a tourist is half a pilgrim, if a pilgrim is half a tourist" (20). [Note 25] Wilbur Zelinsky, Nation into State: The Shifting Symbolic Foundations of American Nationalism (Chapel Hill: University of North Carolina Press, 1988), 180. [Note 26] One reviewer of this book called these reflections "fey," a charge to which I plead guilty. I have attempted to create a sense of the strange and a bit of the "magical" in these personal reflections as counterpoint to the potential banality of buildings and structures that have become boring and predictable national icons. As Lindsay Jones points out, citing the authority of Hans Georg Gadamer and Christian Norberg-Schultz, the act of interpretation (hermeneutics) requires disorientation and unpredictability as well as familiarity (Jones, Twin City Tales, 206-10). Otherwise Washington's symbolism may be neither appreciated nor understood. [Note 27] Quoted in Joseph Rykwert, The Idea of a Town: The Anthropology of Urban Form in Rome, Italy and the Ancient World (Princeton, N.J.: Princeton University Press, 1976), 188. [Note 28] I am taking these characteristics from J. McKim Malville, "Complexity and Self-Organization in Pilgrimage Systems," in Pilgrimage and Complexity, a collection of papers presented at the Indira Gandhi National Center for the Arts, New Delhi, January 5-9, 1999. [Note 29] Turner and Turner, Image and Pilgrimage, 25. The authors stress the democratic and populist, even anarchical character of pilgrimage, 31-32. [Note 30] Robert Penn Warren, Brother to Dragons: A Tale in Verse and Voices (New York: Random House, 1953), xii. [Note 31] Elizabeth Bishop, "Objects and Apparitions," in The Complete Poems, 1927-1979 (New York: Farrar, Straus and Giroux, 1983), 75. [Note 32] Jones, Twin City Tales, 194. Washington, D.C., is a city of powerful symbols—from the dominance of the Capitol dome and Washington Monument to the authority of the Smithsonian. This book takes us on a fascinating and informative tour of the nation's capital as Jeffrey F. Meyer unravels the complex symbolism of the city and explores its meaning for our national consciousness. Meyer finds that mythic and religious themes pervade the capital—in its original planning, in its monumental architecture, and in the ritualized events that have taken place over the 200 years the city has been the repository for the symbolism of the nation. As Meyer tours the city's famous axial layout, he discusses many historical figures and events, compares Washington to other great cities of the world such as Beijing and Berlin, and discusses the meaning and history of its architecture and many works of art. Treating Washington, D.C., as a complex religious center, Meyer finds that the city functions as a unifying element in American consciousness. This book will change the way we look at Washington, D.C., and provide a provocative new look at the meaning of religion in America today. It will also be a valuable companion for those traveling to this city that was envisioned from its inception as the center of the world. Jeffrey F. Meyer is Professor of Religious Studies at the University of North Carolina, Charlotte. He is the author of The Dragons of Tiananmen: Beijing as a Sacred City (1991).